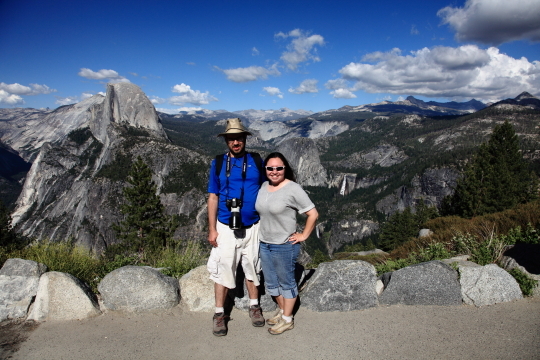 Jamie and I recently went on a trip with some other family and friends to Yosemite National Park. It took eight hours including one stop to make it to the park. After an entire travel day we arrived in our cabin located within the park in Yosemite West. 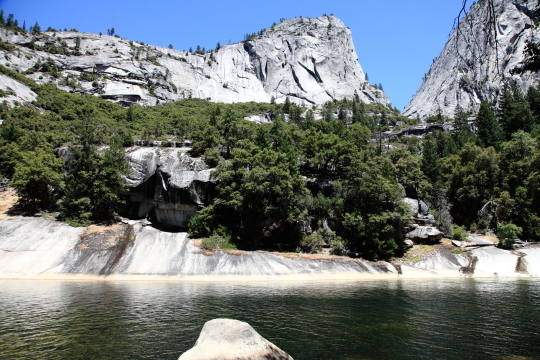 This is located well after Wawona and just before the turn off to Glacier point on highway 41. We stayed in a two story cabin with three bedrooms and another room that can convert the couch into a bed. Groceries were put away and we settled in to get some rest before setting out to explore the next day. 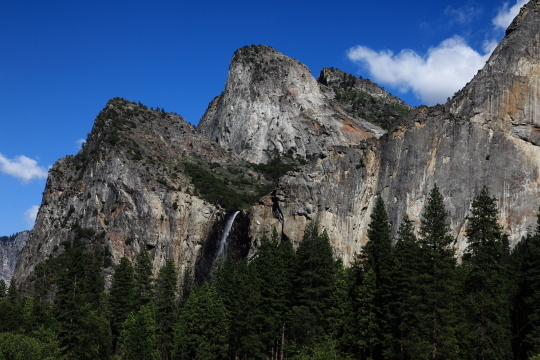 On the first day it was decided to go to the Valley and get a general feeling of Yosemite and visit some of the requisite locations such as the visitor center and the lower Yosemite Falls. The Valley is along Highway 41 and access by way of a long tunnel. There is also a second way in by way of El Portal road which eventually joins up to Highway 120. We did not explore any further north than the Valley however. When you exit the tunnel, you get a pretty good view of the valley. 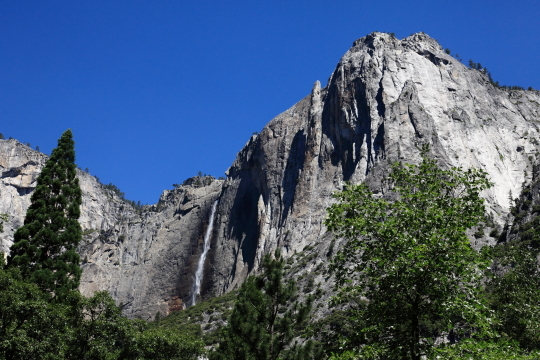 We also explored Bridalveil fall on the way into the Valley. It was on this first stop that we realized just how crowded Yosemite is this time of year. Hundreds of people scurried over the rocks where the path ended to get a closer look at the falls. The way past the end of the path was treacherous and even marked as such and not something that should be attempted while carrying a heavy DSLR. The path up to that point by contrast was paved and nearly flat. After we did all these things we went back to the Minivan and had lunch. We spent the rest of the day in the Valley looking for ice cream. Again we were reminded of the crowds. There is a shuttle system in the valley and each shuttle was so packed that every inch of the isle had someone holding on to the hand railings and standing. A vast percentage of the visitors were from foreign countries. The last thing we did on our first day exploring was drive up to Glacier Point. There is also a path to this point but it is extremely strenuous and takes most of a day to do. At the top we found a crowded parking lot. Once we walked about a quarter mile though we saw the most amazing views. 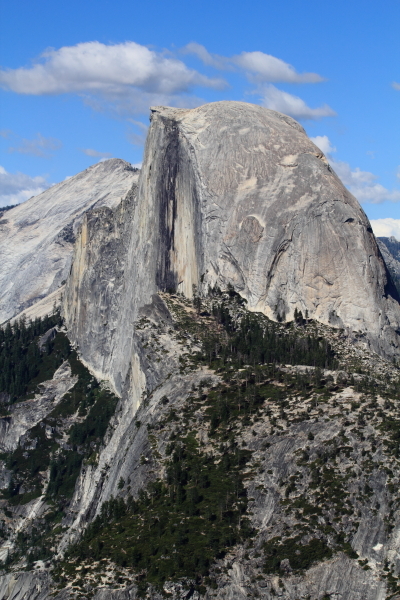 You are able to see everything from El Capitan to Half Dome to Cathedral Peak in the distance. 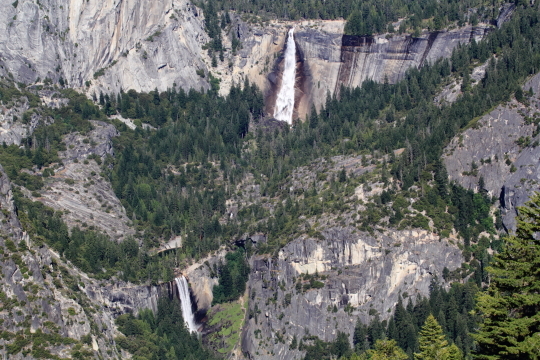 Also visible are many of the falls including Upper and Lower Yosemite, Vernal, and Nevada. If you have Vertigo, you should stay well back from the railing. You can also see almost straight down into the Valley from here. The next day we had breakfast at The Ahwahnee Hotel dining room. From there, Jamie and I went on our own hike and the rest of the group stayed around and explored the hotel. 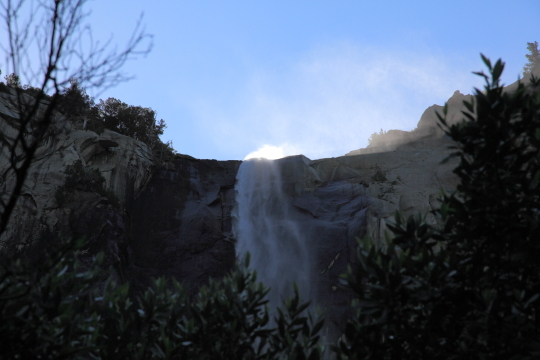 We went to hike Mist Trail. 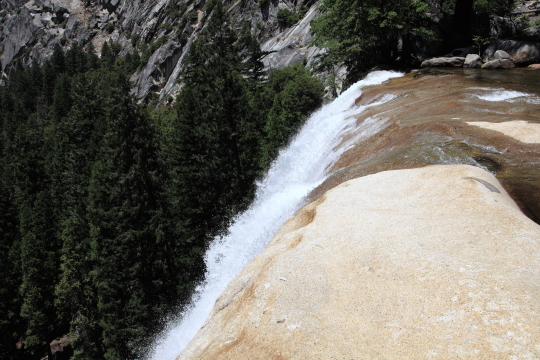 This is the trail which ends at Half Dome although we just took it to the Top of Vernal Falls. This is still a one and a half mile hike with one thousand feet of elevation gain. 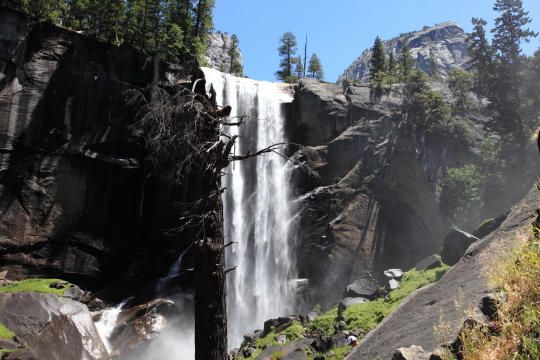 For most of this hike the trail is also called the “John Muir Trail” until just past the first spot you can see Vernal Falls and then the John Muir cuts right up some steep switchbacks. Mist trail continues along the water path and quickly becomes a path of makeshift stairs. Fortunately Jamie and I brought trekking poles which we put to good use on this section. The path brings you up to a section where the path is literally cut into the side of the mountain with a railing on one side and barely wide enough for two people to pass but only if they are touching. Once on top you can see Emerald Pool. This is a pool of water which sits pretty close to the edge of the falls although not immediately next to it. For this reason the signs say “no swimming” which the throngs of people who visited immediately disregarded. Once at the top of Vernal, Jamie and I took a much needed rest and I put in a call to let people know where we were in the hike. Cell phone reception in the valley is pretty non-existent and this is one of the only places I could make a call from. We ate some snacks and finally started down. By this time of course our legs were like mush so the trekking poles came in handy yet again. For the decent we extended them about three inches and then took one step at a time until finally we got down to the shuttle again. The last day our group had to explore Yosemite was spent in Mariposa Grove. There is a shuttle in Wawona which will take people over there during times when the parking lot is full. From the shuttle stop it is about one mile to reach two of the more interesting trees including the “Grizzly Giant” and the “California Tunnel Tree”. These trees are in the lower grove and if you continue on you can find many more interesting trees in the upper grove. 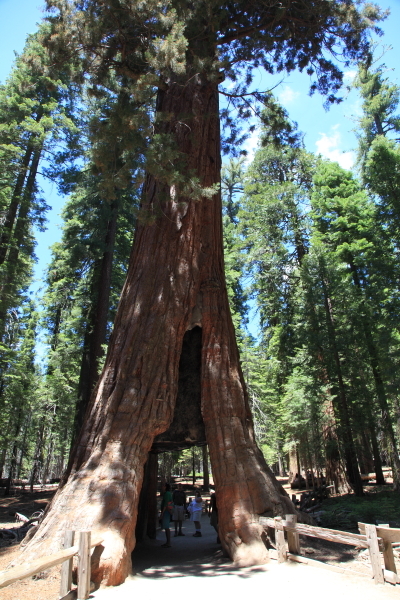 The trees in the grove are diverse but the ones people come to see are the giant sequoia. The Grizzly is by far the widest tree I had seen before and the tunnel tree is cut out so you can walk right through it. Most of these trees have lived through at least one fire and you can see where the trunk is burnt and then covered over with new bark. Finally our trip was at an end and we packed up and headed back. Somehow the trip back only took six hours so we got in plenty early to get some rest before work the next day. 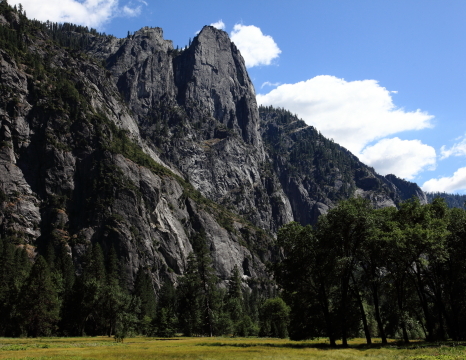 To see more photos from our trip to Yosemite visit our GALLERY.